When you first start Mac, you find yourself in a special program that Apple calls the Finder. The Finder is somewhat like Windows Explorer, but it’s an even more basic tool. You’ll find that you use the Finder all the time. You can get to the Finder by clicking anywhere on the desktop or selecting its icon from the Dock. Pressing F11 makes all other windows go away, and you see only the desktop and the Finder. Press F11 again to bring everything back. You use Finder windows to move around among folders. You see a window when you double-click a folder or choose File→New Finder Window from the Finder. The name of the folder is at the top of the Finder window. You can click and drag the icon to its left to wherever you want, just as you would the folder’s icon in its parent folder. By column: The Column view shows you the contents of the current folder and the folder that contains it, along with, optionally, a preview of any file you select. Widen columns by dragging the II icon below the scroll bars. You can customize the contents of the file view by choosing Finder→View→Customize View Options. By cover-flow: The new cover-flow view is based on the way iTunes and iPods display album covers to help you find the music you want, but in the Finder, cover-flow shows a preview of file contents. Click the Quick Look “eye” icon at the top of the window (or press the spacebar), and you see a readable, scrollable preview of the center file. Click the double-arrow icon at the bottom of that view, and you see a full screen version. Quick Look supports text files, PDFs, movies, Keynote presentations, and Microsoft Word and Excel files so that you don’t have to open files in an application just to see what’s inside. The Finder window toolbar also has back and forward arrow buttons that are initially grayed out. 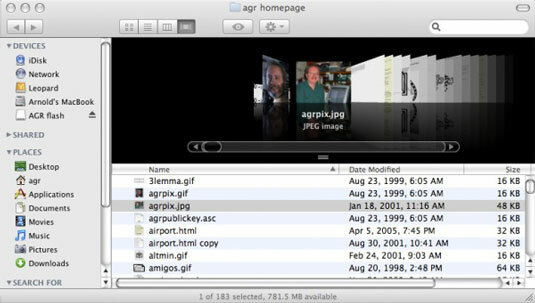 As you open and close folders, these buttons let you return to a previous view, in much the same way as you would with buttons in an Internet Web browser. The Finder window toolbar also has an action menu with a gear icon that lets you choose options that are also available on the Finder menu. You can even customize the toolbar from the Finder’s View menu and add additional icons. The Path icon is particularly useful because it shows all the folders that include the current one and lets you pop back to any one of them. The text at the bottom of the Finder window tells you how much space is left on the disk drive or storage volume on which the folder is located. This is the easiest way to find out how much disk space you have available.